Flank steak isn't one of the most tender cuts of beef in the world but when it's stuffed and has the 30-minute marinating sauce rubbed on it, it takes on a whole new life. 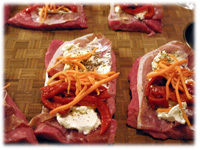 In this recipe the flank is stuffed with prosciutto, cream cheese and several choice veggies like green onions and roasted red peppers and not only tastes fantastic it looks great too. And don't worry too much if you can't find flank steak, try other similar cuts like round or even grab a sirloin tip and butterfly it to make it thin for rolling up. 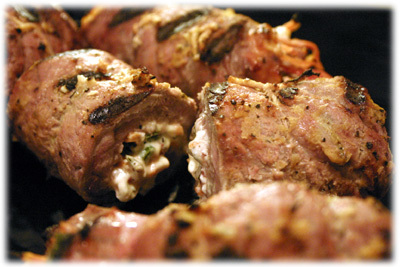 Note: let the stuffed flank roll-ups sit in the marinating sauce for at least 30 minutes for best results. 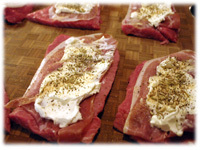 Variation: If you can't find flank steak consider other types like round or sirloin tip for this recipe. Place a piece of steak between two sheets of plastic wrap on your work surface. 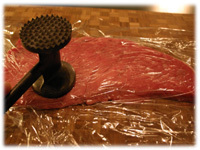 Pound gently with a meat hammer (or rolling pin or some blunt object) until the meat is twice the size and half the thickness. Cut each piece of flattened steak into approximately 3" wide by 4" long strips as uniform as possible (won't be perfect). Lay each strip on your work surface and cover each one with a slice of prosciutto. 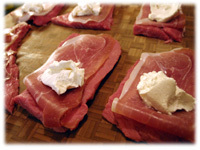 Place 1 1/2 tablespoon of cream cheese on top of each prosciutto slice. Carefully spread the cream cheese the length of the roll-up. 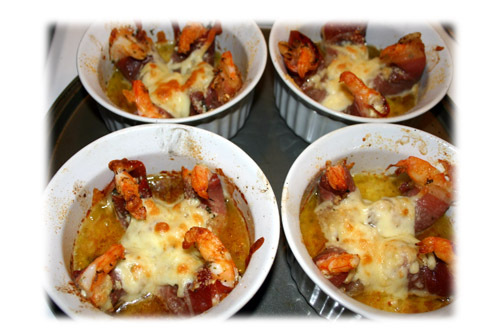 Sprinkle garlic powder and fennel seed over the cream cheese. Place several slices of roasted red pepper cross-wise on the cheese towards the end closest to you. Place several slices of green onion (green parts) cross-wise on the cream cheese next to the red pepper. Place a small amount of shredded carrot over the surface of each roll-up. Carefully lift the end closest to you of one steak roll-up and with one hand begin rolling the steak over the cheese and veggies while the other hand ensures the veggies and prosciutto stays in place. 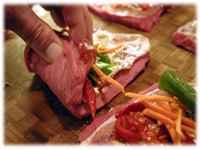 Wrap the stuffed flank steak as tightly as you can to make sure the innards stay in place. 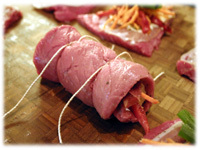 Slide 2 pieces of butchers twine or string under each rolled up flank steak equally spaced. 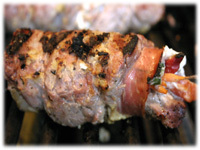 Tie the string so the stuffed flank steak roll-up remains secure. 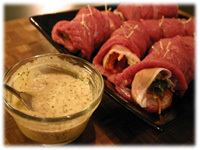 Prepare the marinade sauce recipe using 2 tablespoons Dijon mustard, 2 tablespoons horseradish and 1 teaspoon black pepper, mixed well. 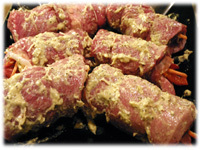 With your clean bare hands spread the marinade sauce over each piece so they're well covered. Cover with plastic wrap and let stand at room temperature for 30 minutes (while the grill is warming up). 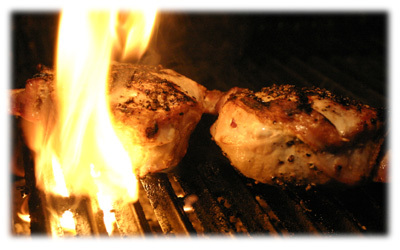 When the grill reaches cooking temperature place each roll-up on the grill and close the lid. 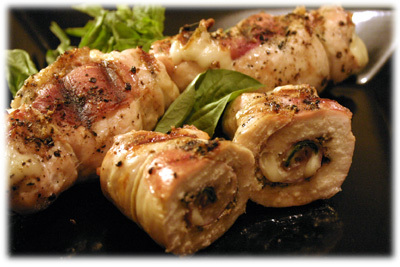 Flip each stuffed roll-up several times as they cook to ensure all sides are evenly cooked. 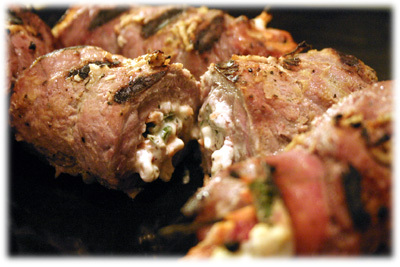 After 10 - 15 minutes this stuffed flank steak recipe should be cooked and ready to remove from the grill to be served immediately.